The UK equity release market has expanded rapidly, reaching heights that would have been inconceivable only five years ago. But recent volume growth has only just exceeded the level reached in the 2003 bubble, which stagnated and then deflated following the financial crisis. Current and potential participants and investors have questioned whether the market is on the cusp of an exciting new paradigm or if the current momentum in equity release will see a repeat of 2003 or even go into reverse. L.E.K. Consulting believes that the drivers behind the dynamism of today’s market are here to stay, providing significant opportunities for existing players and attracting new entrants. This Executive Insights reviews the development of the UK equity release market and explains the macro trends that show that the sector is set for sustained growth. It then highlights the key considerations for distributors, lenders, funders and equity investors to take advantage of the opportunity. The UK equity release market originated in the late 1970s, with basic products provided largely by building societies. By the time of the credit crunch, the market had introduced a number of key improvements, in particular the No-Negative Equity Guarantee (NNEG), was largely self-regulated, and had expanded to include insurance companies and specialist retirement financial services firms. However, the financial crisis caused many providers to exit the market following funding difficulties, leaving it to a few insurers and niche equity release players that offered a limited product range and stubbornly high interest rates. Since 2012, total new lending in equity release has grown by more than 25% annually, reaching just over £3 billion by the end of 2017 (see Figure 1). This growth has been driven by a wider range of consumers adopting equity release as a borrowing solution, helped by significantly improved distribution and new funders joining the market, most notably L&G, which entered in 2015 after buying lender New Life. More new entrants, and significantly increased participation from existing players, can be expected in the near future. Four key demand- and supply-side trends are behind this expansion. 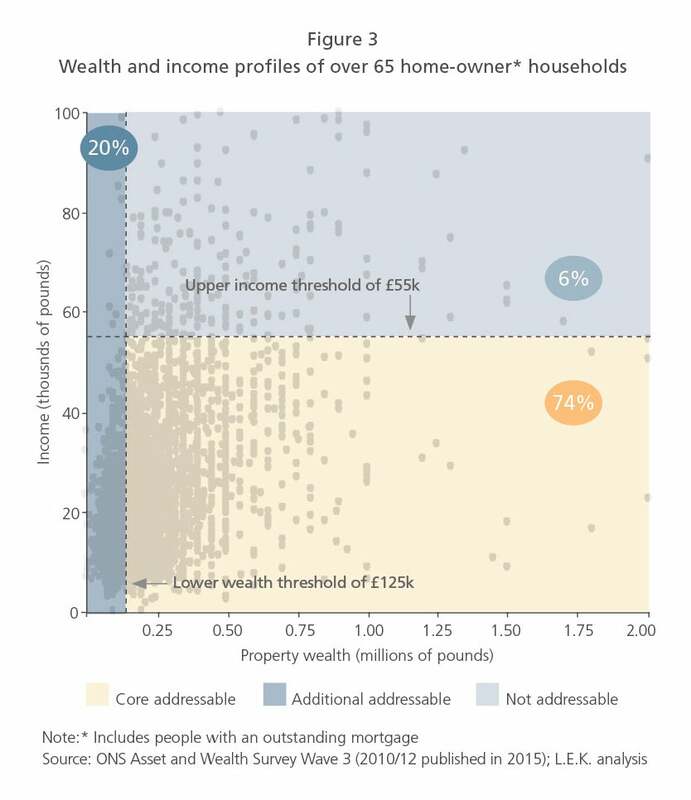 Previously, interest rates for equity release products were relatively high, making them unattractive to customers, particularly in the post-credit crunch world. Average rates have fallen significantly, especially since 2014, due to increased competition, reduced yield expectations from funders, wider product availability and ongoing low base rates. Innovation has led to new product launches that have expanded the addressable market, incorporating features to meet a wider range of specific customer needs, such as different LTVs, flexible repayment options and variable interest rates. In 2012 consumers could choose from 17 different plans, by August 2017 this had increased to 78 different offerings. Although this is now ancient history, early in the equity release market there was no safeguard against customers falling into negative equity as a result of declining house prices. A further lack of regulatory oversight meant that poor-quality advice was often given, with some customers not fully understanding the product they were buying. As a result, equity release had a poor reputation and suffered from bad press. In response, in the early 1990s the industry agreed to the NNEG scheme, which ensures that a borrower’s liability cannot exceed their house value, so house price and mortality risks are largely shifted to the funder. An ongoing focus on regulation, standardising equity release advice and sales processes is adding to customer confidence in the industry and take-up of products, as have the marketing campaigns of leading distributors and lenders. This has resulted in a significant uplift in awareness amongst the core user groups. In addition, the FCA has stated its direct support for equity release mortgages. The complexity of the sales process, and regulation around how advice must be given, continues to mean that the advisory process is onerous when compared with many other financial products, and face-to-face is still the predominant sales and advisory setting. As a result, many IFAs do not actively seek opportunities, but rather react to incoming enquiries and even then often reluctantly. A number of specialist advice providers have capitalised on this failing, deploying their own direct sales forces. Phone-based business models are also starting to be used more widely, as are a number of other cost-efficient means of generating leads, thereby improving the overall efficiency of the distribution process. Increasingly, use of technology has also allowed distributors to reduce the cost of service. Few funders in the past were attracted to underwriting equity release products, not only because of the limited size of the market and its poor reputation, but also because of regulatory issues. Over the past five years, uncertainty regarding Solvency II, in particular, acted as a brake on insurers entering or returning to the market to use equity release assets as a hedge for their long-term annuity liabilities, but this barrier has now been lifted. The current low-yield environment also makes equity release an attractive asset class for holders of long-term pension and annuity liabilities (see Figure 2) due to the combination of very long duration (up to 30 years) and attractive yield (300-400bps). Holders of these liabilities are assessing the opportunity to use equity release as an asset class, though significant annual flow is needed for insurance providers to make this worthwhile. Improved market access is now offered by leading equity release distributors, such as Key Retirement Solutions and Age, and the flow is sufficiently large to attract more funders. There is still a substantial equity release funding opportunity for large back books of historically written annuities, even though the flow of new individual annuities has declined in recent years because it is no longer mandatory for the retired to purchase an annuity. Alternative sources of equity release funding have also emerged from insurance companies and other financial investors focused on derisking companies’ defined benefit pension schemes. With combined liabilities of £1.6 trillion, the defined benefit market is of sufficient scale to underpin strong growth in equity release for the foreseeable future. Much to the insurance industry’s relief, regulatory issues were dampened in December 2016 when the Prudential Regulation Authority (PRA) advised that equity release assets could be included in insurers’ annuities risk-matching calculations. Several factors are converging to position the equity release market for further significant growth. The demand for retirement lending products, such as equity release, is expected to increase and drive penetration as more retirees need additional sources of income to pay for their health and lifestyle choices, especially given shrinking pension pots in the wake of dwindling membership of defined benefit schemes and low yields on their savings. Although only a small proportion of addressable households are aware of and consider equity release today, the opportunity for growth is strong and the impact of marketing is expected to increase as large players, such as Aviva, L&G and Key Retirement, continue to invest in TV advertising and other mass awareness techniques. Average loan size is growing due to a combination of factors: target customer property values are forecast to rise by around 5% a year to 2021, and equity release products are becoming increasingly attractive to homeowners with more valuable property. In addition, product innovation is expected to drive moderate growth in loan-to-value rates. Further demand for equity release may emerge from those over the age of 55 looking for solutions to clear the outstanding balance on their maturing interest-only mortgages. Of approximately 500,000 interest-only mortgages due to mature over the next five years, more than 10% are held by borrowers with no repayment strategy, many of whom may look to equity release to meet their needs. Taken together, our view is that the market will grow significantly, with a plausible range of £4 billion to £5.5 billion annually by 2021, up from just over £3 billion in 2017. The fundamentals of the current UK equity release market appear sound and point towards a sustained growth trajectory, rather than a repeat of 2003. The challenge for distributors, lenders, funders and equity investors, whether already in the market or thinking about entering it, is how best to address this substantial opportunity profitably. The first step is to ensure a full understanding of how to access consumers and the key levers for growth. Distributors and funders must recognise that there isn’t just one ‘big lump’ of demand, and develop differentiated positions based on customer segmentation, product innovation, marketing, and funding flexibility and availability. They must also ensure that they understand the evolving regulation affecting equity release, and stay on the right side of it to avoid any risk of mis-selling. For equity investors to succeed, they must be able to map out those industry participants with winning strategies and look for sustainable differentiation even as the balance of market power between distributors, lenders and funders evolves. The potential prize is very substantial, but winning will not be as simple as ‘pouring money’ into this market and riding a growing market wave. A winning strategy needs to be differentiated and sophisticated, and based on market fundamentals.